During our previous visit to Miami, we drove by Blue Collar (@bluecollarmiami) and noticed it had an enormous crowd gathered outside the small restaurant. We quickly looked it up and with a 4.5 star rating on Yelp we promised ourselves we’d check it out on our next visit. All these people can’t be wrong, after all. The small space also fits its name. 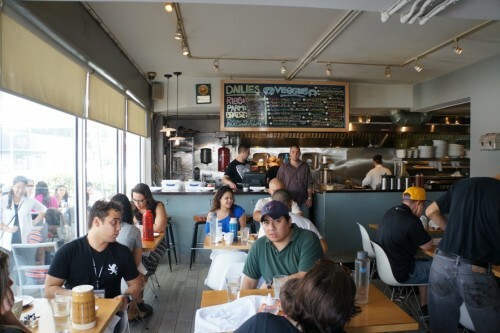 With friendly service and basic, no-frills décor, Blue Collar has a very casual and low-key vibe – not at all pretentious like many restaurants in Miami can be. 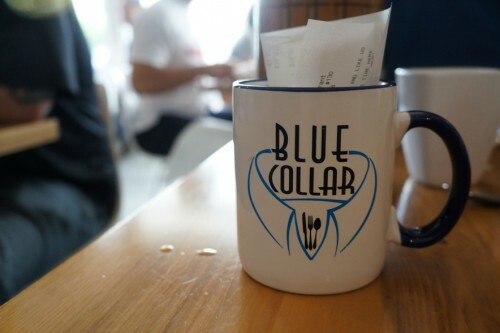 With a name like Blue Collar, I think you can imagine the theme of the restaurant – American comfort food. Mike and I dropped by for brunch (served on weekends) which features an extensive menu of tempting options. There’s a long list of “Eggy Stuff” (scrambles, benedicts, etc), sandwiches, salads, entrees and a couple things under “Syrupy Stuff” (French toast, pancakes). They also have a Veg chalkboard which features an incredible selection of veggie dishes ($5 each) which include warm bacony potato salad, roasted beets & goat cheese and curried cauliflower puree. We started off with some Coffee ($4 per person) – an unlimited supply which comes in a thermos, playing off their Blue Collar theme. 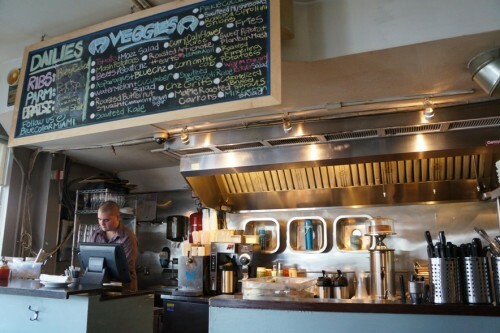 The restaurant serves Panther coffee (@panthercoffee), a Miami-based specialty coffee roaster. They roast some damn good beans. Mike ended up drinking four cups! 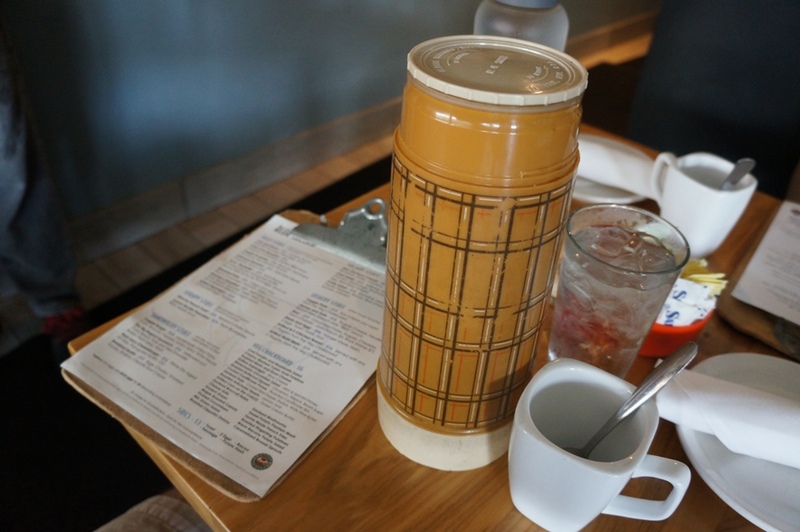 Panther coffee…served in a thermos! Even though we were here for brunch, the more “lunchy” items caught our eye. I ordered The Big Ragout Sandwich – hollowed-out crusty bread, pork and veal shoulder, brisket, fresh mozz, parm ($16). They’re not kidding around when they say “big”. This enormous sandwich could’ve easily fed the two of us. Blue Collar certainly doesn’t skimp on the meat. 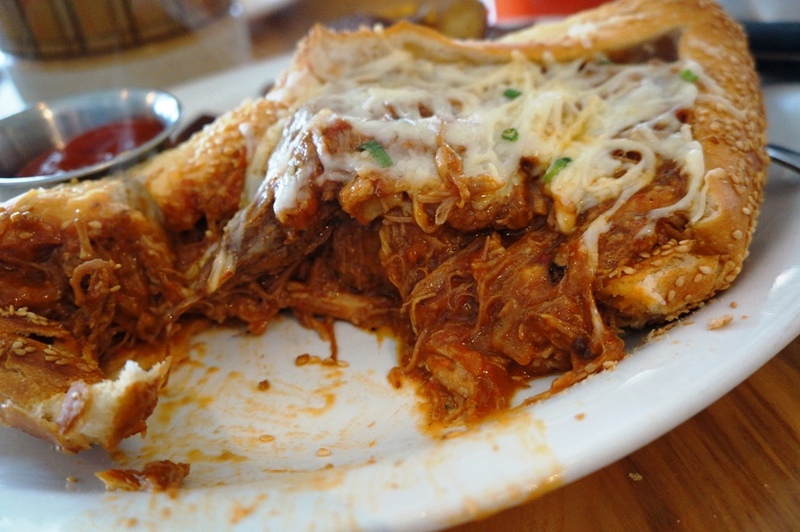 This beast of a sandwich was packed full of delicious, tender meat. The hollowed-out crusty sesame-topped bread was a great vehicle for the sandwich which held up surprisingly well against the sauce. Needless to say, this is one of those knife-and-fork kinda sandwiches. As if the sandwich alone wasn’t enough, it comes with your choice of fries, fruit salad, mixed greens or hash. We decided to go with the latter but needless to say, the hash went largely untouched after we stuffed ourselves with the sandwich. As a side note, if you’re looking for the sandwich, you won’t find it during dinner service. Instead, it comes in the form of a pasta dish. The other dish we ordered was the Shrimp and Grits – Trugole cheese, Nueske bacon, New Orleans style “BBQ” sauce ($15). The thick pieces of bacon were incredible and the New Orleans style BBQ sauce was packed full of flavour. The shrimp were well cooked and I loved how cheesy the grits were. 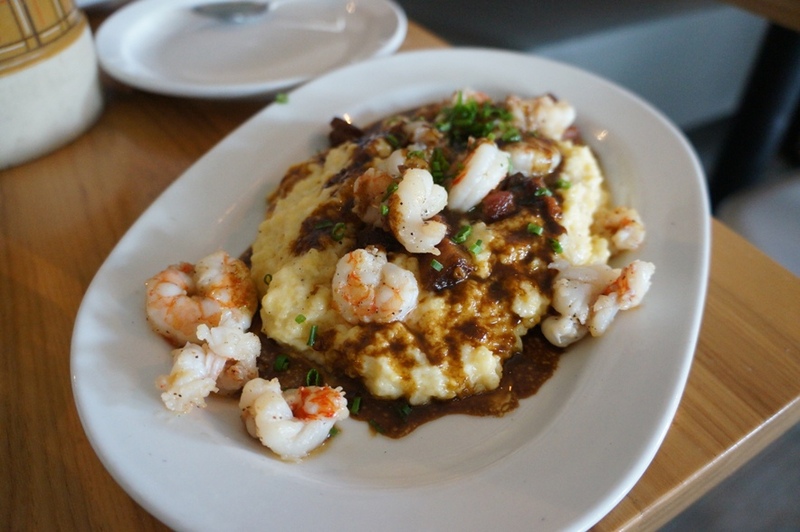 While I enjoyed the Big Ragout, the shrimp and grits definitely stole my heart! I’m happy to report that Yelp didn’t steer us wrong. Chef Daniel Serfer definitely has a good thing going here. 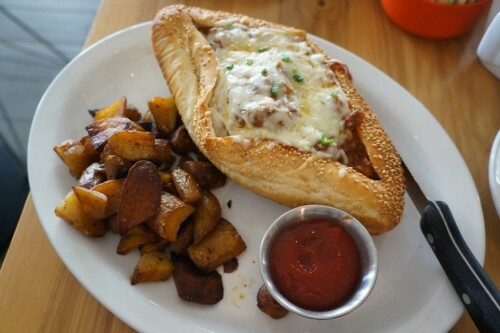 If you’re looking for a delicious, unpretentious meal in Miami, Blue Collar is the place to go! • The shrimp & grits are a must order!